This Saturday, the iconic Tauranga Half celebrates its 30th Anniversary at Mount Maunganui. Among the competitors on the start line at Pilot Bay will be inaugural woman’s winner, and record entrant for the event – Karen Williams. This will be Williams’ 29th tilt at the Tauranga Half, missing only the 2017 event following major surgery. Karen Williams, who has become somewhat of an event icon, still fondly remembers the inaugural race on 2 January 1990. She arrived in Tauranga late on New Year’s Day, due to her husband working late. She stayed in a tiny tent on a sloping property, and recalls getting “next to no sleep” before the event. Despite this, less than ideal preparation, determination kicked in once the starters’ gun went off, and Williams emerged from the swim on Pilot Bay in second place. She quickly took the lead on the bike leg, and was never headed from this point, winning the inaugural Tauranga Half in a time of 4h 53min 53 secs. There were no wild celebrations following the win, with Williams racing back to Auckland to catch a flight to Los Angeles, as she was working as a flight attendant at the time. Her’ determination to complete every Tauranga Half was to the fore in 2009 & 2010 when William’s overcame major injuries and extreme discomfort to complete these events. In 2008, she was hit by a concrete truck while out cycling. This meant that she did the 2009 Tauranga Half unable to use her left leg effectively. She did the swim kicking with one leg only, and wore a full leg brace to walk the 21km run. She had major surgery to realign and rebuild the left leg. Weakness in her left leg resulted in a fall which dislocated her elbow and broke bones in her arm three weeks before the 2010 event. She ended up doing the swim leg using just one arm, and getting special dispensation from race organisers to swim with a sleeveless wetsuit to make it easier to pull off the wetsuit, with the use of one arm. With only one arm functional while riding meant she was unable to change gears, so stayed in the same gear for the entire 90k bike leg. Having use of only one arm also meant that she didn’t have a spare hand to be able to eat or drink on the bike journey. She even struggled to get her helmet on with one hand, and required assistance to do up the helmet strap. Despite, these extreme challenges, Williams’ determination saw her complete this Tauranga Half. 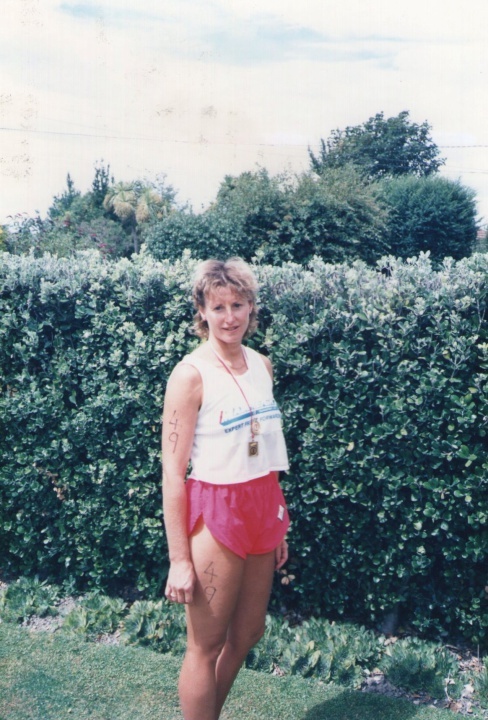 This determination to complete every Tauranga Half has made Karen Williams a legend of the event. She was given the ‘keys to the city’ by the Tauranga Mayor, along with fellow Tauranga Half legend Cameron Brown, in a special Council presentation. The Tauranga Half which takes place this Saturday (12 January) is the headline event for the Mount Festival of Multisport which includes a range of athletic and community events in Mount Maunganui from 11-13 January.